We absolutely love Bali and have an ever-growing bucket list to this amazing island of the Gods. This is our longest Bucket List yet! We’ve been to Bali a couple times and we still haven’t managed to tick all the boxes yet! But we think it’s great to have some things still left on your bucket list so you know you’ll always go back…and add more to it each time! This Bali Bucket list was like all our past ones – complied and organized from notes scribbled on scraps of paper, napkins and scattered notes on our phone. Every time we go to a new place, city or country, we will separately write down our bucket list for that place and put it all together. Not only does it get us excited for our trip, it really helps us to plan and organize where to stay, and when we should go where. Even if you’re not much of a planner when you travel, try getting a rough bucket list down and you’ll see immediately how it helps plan out your trip. As always, our list is a dynamic list so we’ll be crossing things off we go. And anything in yellow-gold is linked to a blog we wrote about the place, so click through to get the details! 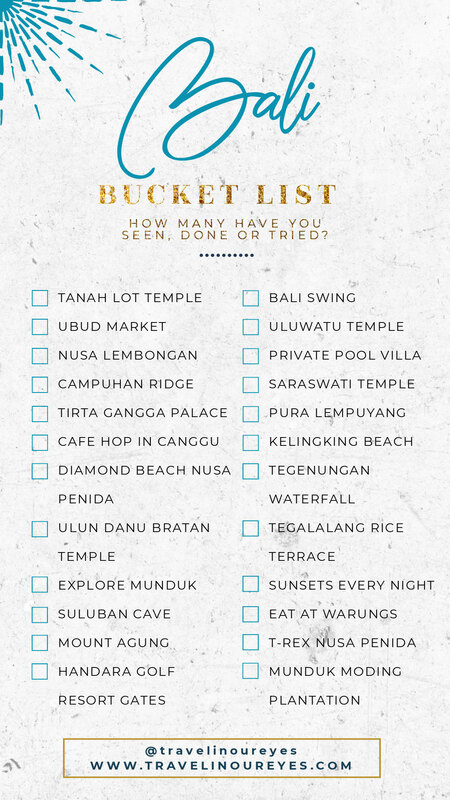 Feel free to use this as your Bali Bucket List template as well; on your blog, social media, Pinterest, whatever! We would just ask for the credit mention and a tag/shout. So here it is! Our Bali Bucket List! Have you guys been to any of these places? What are some of your favorites? We’d love to hear what you suggest to add on to our Bali bucket list. For a list and the latest prices of where to stay in UBUD Bali, Check here. Check here for a list and the latest prices of where to stay in SEMINYAK Bali.